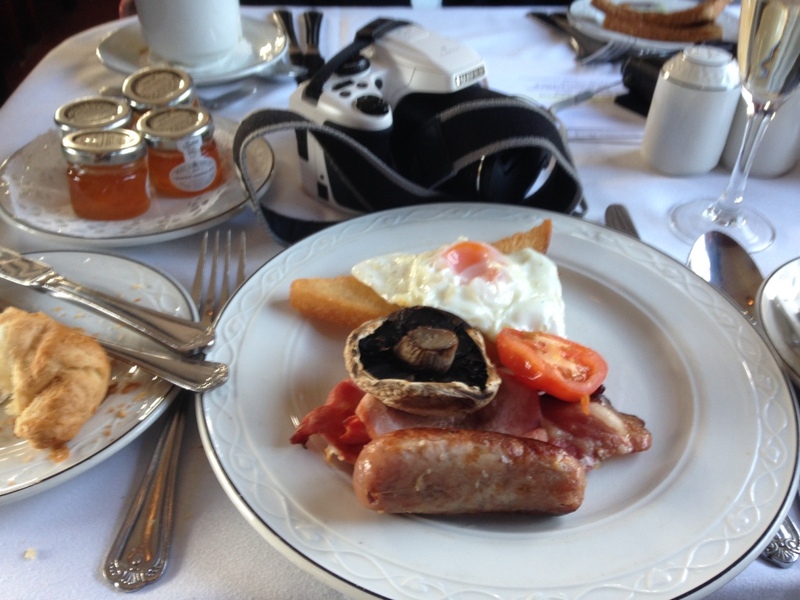 This is a little different from the norm on this blog! Instead of locomotives from the Late and Never Early Railway (L.N.E.R.) 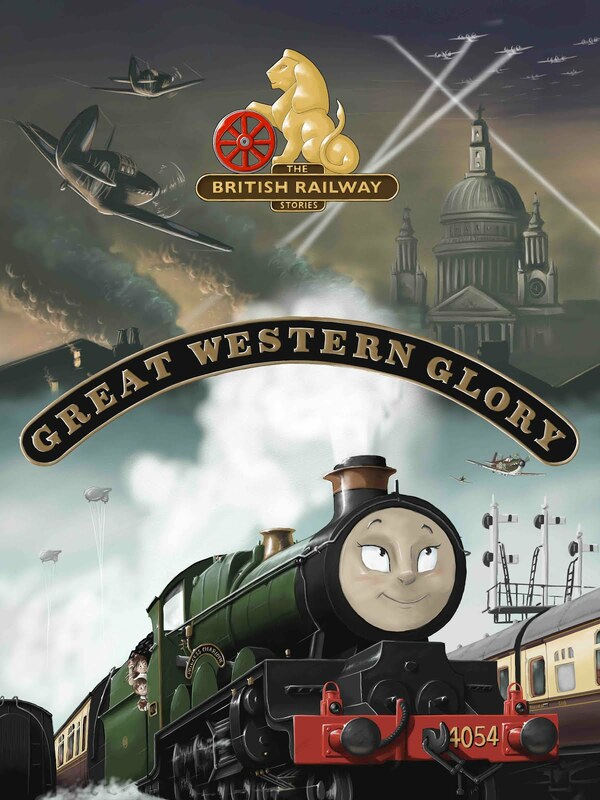 we see one from the Gresley Was Right line, or as we really know it, the Great Western Railway. Hornby's King class model has been a few years in the making and replaces the older, tender drive era model of years past. Announced on Facebook (a first for the company?) a few years previously, I'm a little behind the curve with the production batches of Hornby's King, but when 6011 King James I became available in thislivery, I knew I needed to look into this model towards my own model railway. 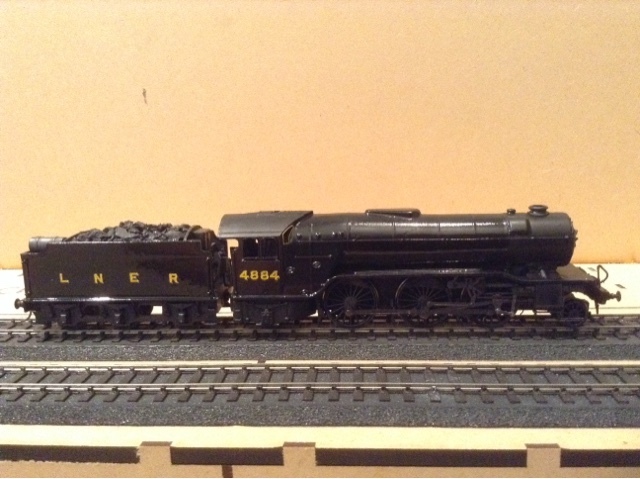 For one King ran on the Eastern Region during the 1948 exchange trials, and the intention is to run one such model together with my model of the LNER's Dynamometer car. I've borrowed a few books, drawings and looked at photographs closely for this review. I've really gone above and beyond for the research stage of this review, because there will be at some point two ready to run King models from two sources (Hornby and DJ Models/Hattons) and I want to be sure of any facts or figures before giving my personal view on which is better. There's a lot of debate on the online forums about a number of the detail parts fitted, including and not limited to the superheater headers, questions about the livery including and not limited to the route indicator discs on the cabs. On this particular model I believe it should have the red discs on the cab sides, however I'll leave that to more knowledgeable people: though I have enjoyed very much trying to work out what I need to do for my chosen locomotive, King Henry VI. So how much do I really need to do? The answer is: not a lot. I need to change the branding on the tender, primarily, add some wiring for the Dynamometer car to the rear, weather it, add appropriate lamps, real coal and so on and so forth. Changing the nameplates and numbers is going to be a literal doddle compared with what I am used to! The superheater header appears to be on the correct side too which is a relief. I don't need to change the steam pipes either. So far, so good. I've never been much of a Great Western fan before, but the King really does have a presence all its own. There's little things, like the coupling rods and slide bar brackets that are much better designed and much bulkier than older offerings (which not so long ago were plastic in the mid 90s, with the older tender drive derived King). There are sprung buffers all around. The new arrangement for the front bogie is a significant improvement on models past. The front bogie itself is very nicely done and has both a weight and look that makes it look as heavy duty as the real thing, older models tending to look like they had skateboards attached at the front end. The levers to the inside valve gear is modelled for the first time and is very convincing. The overall face of the machine, and all major dimensions, seem spot on. The buffer beam detail is surprisingly fine and I did have to look twice at photographs of the real thing to compare. The cab detail is excellent. I cannot believe how good the water gauges are on this model. I know it's a really rarely seen bit of any model, but on Great Western engines which tender to have more open cabs (like the City class) it is something you see quite clearly. I wouldn't call the King footplate "exposed" but with that tender design, unlike my LNER locomotives, the cab can be seen much more. It adds that extra layer of realism to the model and lifts it higher in my view. The tender seems to match all of the various drawings and photographs I have amassed for my chosen locomotive. The livery application throughout is just exquisite. The lining out on the frames in particular are very fine. hough I am unsure at this stage of the colour of the dome. It looks a bit too...I don't know, lemon-y, as opposed to a shiny metallic colour. That was one of the things I always admired on the older king models, the metalwork did look like the metal it was supposed to be (brass or copper). They are meant to shine, after all, and here the matt finish doesn't really look the part for me. This is a very minor point, I hasten to add. There's just one other problem with the model, for me anyway, and again it's about the choice of the colours used. It's the shade of the colour green. I've taken photographs of the model in every light source imaginable, I've um'd, ah'd and procrastinated over it but the truth of the matter is that the Great Western Railway green used is wrong. It is far, far too light and lacking in the deepness of colour that the real thing has. The truly odd thing is that this shade seems to match the same paint that Hornby were putting on their open cab Pannier Tank locomotives some ten years ago, and it looked odd back then too. It also matches that on the recent Hall and Star models, neither of which in their GWR liveries looked the part to me. Is this a huge deal? No, it's not a deal breaker. Yes, it does offend my particular brand of obsessive compulsive perfectionism in railway models, and yes I do think my King could potentially benefit from either weathering or a complete strip and repaint. Is it so bad that you shouldn't buy the model if you need a King? I don't believe so. It annoys my eyes but not to the extent that I couldn't put up with it in some form. Can Hornby do better with the colours? Undoubtedly, it just takes some of us to be constructive and polite when asking them to do better next time. The green needs to be better. That's pretty much the full extent of the problems with Hornby's Kings. That's not bad frankly and shows just how far Hornby have come with their models of the Kings. The King has the presence, the power and the detail to be a contender for one of Hornby's best models in their range. Put a better livery finish on it and it is elevated to one of the best models they've ever produced. The running qualities were unbelievable when I ran it in at the Erith Model Railway Club. I cannot stress enough how impressed everyone was. It was quiet, smooth and powerful, taking on 13 Bachmann Mk1 coaches with ease, no mean feat. This wasn't on the level either so there's no doubting the performance. If I had one criticism of the running quality, I felt the front bogie looked like it wiggled somewhat as it ran. I later discovered the back to backs on the wheels were out, and having sorted this I feel it runs more smoothly. When the DJ Models/Hattons designed King emerges it'll be interesting to compare and contrast these releases. In my view I think Hornby has pretty much nailed the King, giving Great Western fans an express locomotive with the looks and performance they've missed out on for some time. We LNER fans have been pretty lucky with all of our ducks (ha ha) lined up in the form of the A4 and A3 for some time: and we are set to get another stunner next month in the form of Hornby's B12. Truly a golden era for Hornby's research and development team, and a welcome recent announcement from Hornby about looking into how they interact with their retailers. A great development which I hope will result in a number of our most cherished model shops getting things back on track. All parties need a win in this difficult post Brexit economic climate and I am encouraged by the rumblings at Hornby. It's with great pleasure that I present for the first time on this blog a locomotive class which isn't part of my overall modelling plans. I had no intention of buying a Hornby Raven Q6, and yet I now find myself besotted with the original and having ordered another, with both destined to become Tyne Dock examples in due course. So how did we get here? That's one question. Perhaps a better one is why didn't we get here earlier? In the North of England there are many beautifully industrial railways with steam locomotives of various vintages that ran to the end of steam. The Raven Q6 is one of those, and luckily for us, one is preserved and currently running on the North Yorkshire Moors Railways. There were some people who wondered if we'd ever actually get here in modelling terms. A specifically North of England steam locomotive made by a major manufacturer for the mass market. It's all well and good throwing in the odd elderly Shire class, or a Scottish liveried Black Five, or a Robinson D11 with a slightly different chimney and cab roof, but it doesn't escape the fact that for the North of England, and specifically the North East of England, model railways have been severely lacking in products, excitement and general all round recognition that the region exists. Hornby and Bachmann have produced some buildings in their Skaledale and Scenecraft ranges (including specifically North Eastern style sheds, water towers, signal boxes and even Goathland station). It is made even more strange when you consider that the North Eastern Railway (NER) in particular was one of the major components of what has been Hornby's money maker for some years: the London & North Eastern Railway (LNER). Sir Vincent Raven's designs built for the NER varied hugely from humble tank engines, fast Atlantics to the somewhat unwieldy Pacifics and the beautifully rugged freight engines. It's in this bracket that we find Hornby's latest steam outline model, the Raven Q6, answering the prays of many people who've hankered for a steam locomotive with that North Eastern pedigree. Of course, it could have all been very different. There was also a "crowd funded" model mooted by DJ Models a few years back. Happily for modellers there's been no duplication this time around, and the Hornby model was pushed ahead for release in 2016. Let's face it, when it comes to steam locomotives and particularly ex-LNER steam locomotives, Hornby has a track record by far and away better than anyone else in the market. 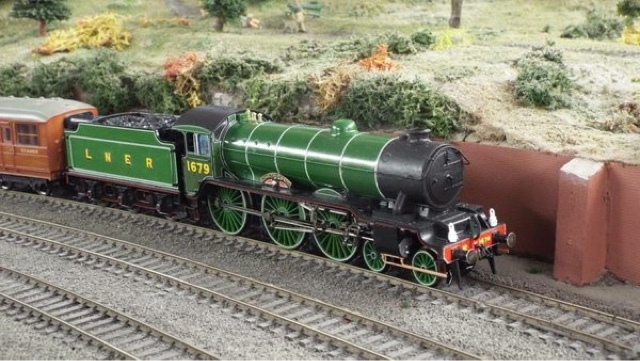 Bachmann has come very close with a few of its models, most recently the Ivatt Atlantic, but Hornby's Thompson L1, B1, Gresley B17 and most recently the Worsdell J15 and Gresley J50 are on another level to everything else. They led the way with revamped models of the Gresley A3 and A4, and the rest followed. Truly, if you follow the LNER, now is the time to be a 4mm scale modeller. You will never be able to have it as good as it is right now. Heljan recently released a model of the Gresley O2 fright engine at an entirely comparable price to Hornby's Q6. It however doesn't measure up very well by comparison, I am afraid to say. If you need a Gresley O2, this is the only game in town. It has a number of features which I personally do not like, and objectively speaking its overall finish is not particularly fine when compared to many of its excellent diesel electric locomotives (I cite Falcon and Kestrel - both beautiful models). Given the Hornby Q6 has a similar wheelbase, overall size and is being sold at a similar price point makes it in my opinion a reasonable comparison of models. But there is no comparison. Objectively speaking there is an incredible gulf between the two models. In almost every way possible, the Hornby Q6 is the superior model, even accounting for some potential detail errors (lack of capuchon, mechanical lubricator, etc). The fit, finish and running qualities of the Q6 just by far out strip any other steam outline model out there. 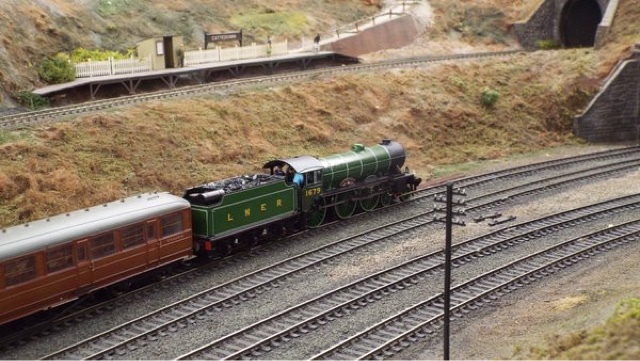 For this review, I conducted some running in trials of the Q6 on 29 June 2016 and everyone at ERMS (Erith Model Railway Society) who examined the model was taken with it. But we were blown away by how incredibly quiet and competent the chassis is, without any modification. By contrast, my Heljan O2 runs extremely poorly and is much louder. 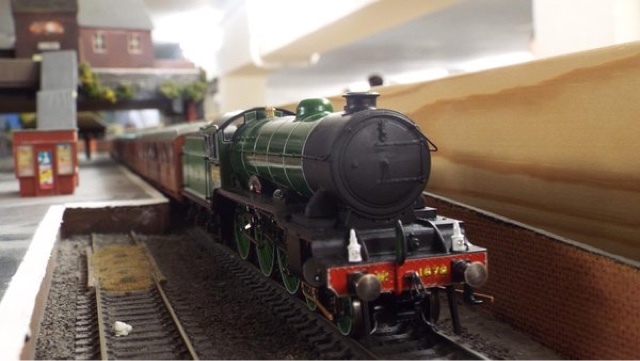 I have previously been forwarded some screenshots of work done by others on the internet to improve their Gresley O2s and to me it's an excellent starting point for some modelling. But the Hornby Q6 is better value for money. Less modifications need to be done, if any, to make it look like a proper LNER workhorse. It has a better motor and gearbox arrangement, separately fitted lamp irons, metal handrails and handrail knobs (Heljan's O2 has hideous plastic ones which look and feel cheap), sprung buffers and a plethora of other separately fitted details. By comparison, Heljan's O2 has mismatching tender handrails, poorly designed outside valve gear, an incredibly misshapen chimney and a less than smooth drive in either forwards or reverse running. I feel like I could trust the quality control of Hornby implicitly with this release, which I can't say with Heljan's O2. The Hornby Q6 hasn't got the double fly wheel drive of the Worsdell J15, but it doesn't need it either. So does the Hornby Q6 measure up for accuracy to prototype? You bet it does. Surprisingly, this is a model which Hornby haven't laser scanned, preferring to climb all over the real thing and measure it up traditionally. Which I approve of wholeheartedly as you may find things which you don't get from a laser scanning device (a useful tool undoubtedly - but not infallible). This means that in real terms, the Hornby Q6 model compares very favourably to scale drawings and photographs of the real thing. This model - like all in the first batch - carries a diagram 50A boiler (the later type fitted by the LNER) and a chimney without a "windjabber" or "capuchon". It also has the mechanical lubricator fitted to the right hand side, and does not have a sandwich buffer beam fitted. It is in late LNER livery, with the plain yellow Gill Sans lettering and numbering that Edward Thompson introduced when chief mechanical engineer of the LNER. The detail in the cab is absolutely bonkers: the boiler back head is possibly the most realistic and detailed I have seen on any steam outline model. It is extremely fine, and really only needs some weathering and a crew to complete the look. If I have one criticism of the design of the model, it is that the tender is very light and possibly prone to derailing as a result. I have not however in eight hours of running this model encountered a single time that the model's tender derailed. So this criticism may in fact be unfair. It is easily fixed by adding real coal or liquid lead when the moulded plastic coal is removed to add weight. There's a few other nit picky details I need to get out of the way at this point. Bear in mind, I'm an LNER modeller and as such I, and others like me, are going to be looking closely at these models for modelling purposes, and we may find more fault than others because we know what we're looking for. (But I caveat that with fully accepting the Q6 isn't my normal fare and I have relied on my friends who have looked after the real thing to point me in the right direction of prototype photographs and film online). Firstly, I'm pretty sure looking at the photographs I've collated that this Q6 (3418) should have a capuchon on the chimney. However when I asked Hornby about this, they replied that on this particular locomotive, they had evidence the capuchon had been corroded away and had taken the decision not to model it as a result. It's a fair response in my view. In my time rustling through books (RCTS, Yeadon's, a few books on the North of England railways and my late grandfather's photo collection) there's a few photographs to suggest that the capuchon was damaged regularly on Q6s. Whether that justifies not modelling the capuchon on this locomotive, when they have such a chimney tooled up on the British Railway liveried models, is up to you. Secondly, the mechanical lubricator. The RCTS (Railway Correspondence and Travel Society) series of books indicates that the type fitted to this model was post 1949, which is British Railways days. I've looked at photographs and I believe it's not wrong for a 1946 era Q6 to have this type of lubricator. However whether it is correct for 3418 is another matter. I simply don't know - I haven't as yet found a photograph of 3418 herself. Then there's the smokebox door. On some forums there's been doubt about whether it should have been this type of smokebox door or the larger, more bulbous later one as fitted to the British Railway versions. Happily I've found a large number of 1946-49 era Q6s in photographs fitted with this door, so I am content to say it's most likely accurate, if not for 3418 then at the very least for a classmate in this period. The numbering and lettering on this version looks a smidgeon anaemic to me. However the colour and shape of them looks accurate. That is the most minor point possible. This is a fair criticism if what you expected was a pre-war Q6, but Hornby haven't sold it as such. It's definitely post war and its condition reflects that. In order for Hornby to model a fully pre-war Q6, it also requires tail rods to the cylinders, possibly a sandwich buffer beam, original NER buffers (and not the square based group standard ones fitted) amongst other minor details. I asked Hornby if they were going to produce this type, and they stated a pre-war version with the 50A boiler type is definitely being on the cards. I suspect (and this is my view, not one Hornby have offered) that an LNER liveried Q6 was always going to be needed for the first batch, but to maximise the tooling available a post war one was easier to produce than a pre-war one. There's nothing wrong with that intrinsically, but if you model the LNER 1923-46 then this Q6 isn't accurate. That takes nothing away from what is the model of the year, for me at any rate. I've never known a model to look so comfortable pulling a train or be so quiet and smooth when doing so. The chassis is a testament to Hornby's current design ethos, and the sharpness and accuracy of the body shell a testament to Hornby's tool makers. For me, Hornby are at the top of their game once again. The excellence of the K1 and J15 last year have continued into 2016 with the superb Q6. Of course this is all set against the current backdrop of Hornby as a company being in dire straits. The situation is grave. All I can do, as a railway modeller who understands the value of Hornby as a company, is encourage those closet North Eastern modellers to buy the Q6s and the 21 ton hoppers in spades. They are both excellent models, and no doubt this won't be the last Darlington built model to be released by Hornby in the future. 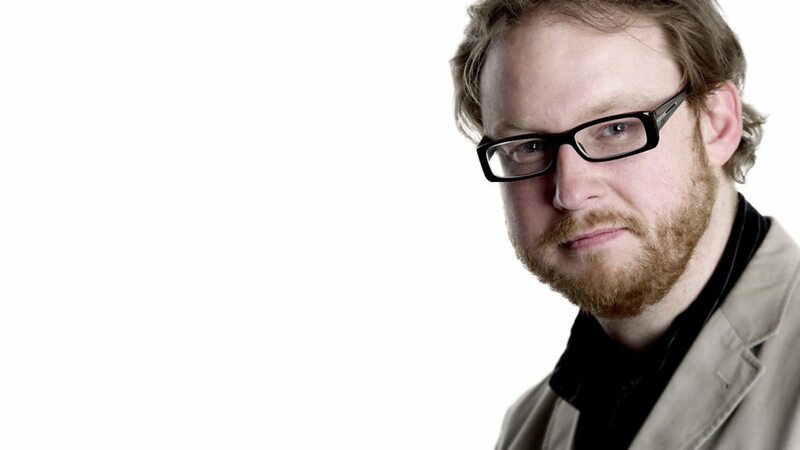 For the sake of the hobby, we need Hornby to survive. We can do this by helping them to understand when they get it wrong - and by supporting and praising them when they get it right, like any other manufacturer. At the end of the day, I'm not paid to write these reviews and I have absolutely no interest in mincing my words. I've previously always been very forthcoming with constructive criticism where it was required - see Hornby's Great Western heavy tanks or their Duke of Gloucester models to name but two that felt the wrath of my keyboard - but equally we've got to praise and support them when they get it right, because it's to the advantage of all of us in the hobby that Hornby as an entity survive. I don't normally give scores on this blog, but if I was to give a score out of ten, this would be a nine: not perfect, for like any model there are people like me and more knowledgable than me who will know a few details are wrong, here and there. 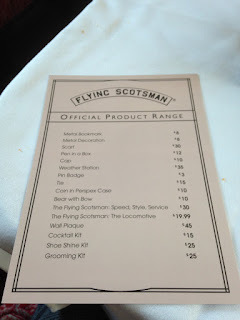 But the overall quality of the product and its performance by far out strip any other steam outline model on sale today. Well done Hornby, sincerely, and gratefully. "Following Charlton, my only desire"
There aren't many words that I have at my disposal right now. It's a sad evening to be a Charlton fan, but in light of the joyous news elsewhere in my friends circle (the birth of a beautiful baby girl) it's hard to get entirely worked up over the inevitable end to what has been the worst season at Charlton Athletic for many, many years. The above photograph hangs in our study, and it's one of my earliest memories of football. It stands out because it is taken in front of the old Wembley Stadium, with my little sister Claire on my left, my mother Jill clutching her flag and my father Jerry stood behind. All of us are wearing Charlton gear in some form or another, and to our left and behind us is a Charlton fan looking directly at the camera, and to our immediate right and behind us, a Sunderland fan is also looking at the camera. Football matches are unique. They are the coming together of two different teams, playing the same game on one pitch, having to deal with the same factors, both internal and external, and ultimately the end result is a game of two halves, and two stories to tell. Following the 1st Division play-off final of 1997-1998, there were two stories to tell. One was the big team from the North failing at the last hurdle to gain promotion, despite playing some exceptional football, with a big, passionate, and very much brilliant crowd behind them, and the other story was the small club from south east London, coming off the back of some of the worst years of their club's history, against all odds being promoted to the Premiership. This match sticks out in my mind because it summed up what football has always been about for me. From start to end, it was a joyous, nerve wracking, exciting, brilliant display of football from two football teams who just wanted to play to win and were doing it for their incredible supporters. It is the one game of football I remember where there doesn't seem to be a controversial decision, there's no diving, the fouls were minimal, but there were lots of goals, end to end action, and at the end of it, some beautiful and respectful sportsmanship from the Sunderland and Charlton faithful to each other. Either team could have gone on and won that match: but for the hand of Saca Ilic, it could have been Sunderland. History records this as one of the greatest matches played at the old Wembley Stadium. Ending 4-4 after extra time, it was 7-6 to Charlton on penalties, with club legend Clive Mendonca becoming the last English player to score a hat trick in a cup final at Wembley. He was my hero of heroes, and to this day the urge to sing out "Super Clive Mendonca" remains strong. The point of this article is that this photograph wouldn't have been possible without a number of decisions being made in the late 1980s and early 1990s. For the fans to take on an election and win to get the ground back, after years in the wilderness at Selhurst and Upton Parks. For the fans to clear out the derelict Valley, with people of all ages, ethnicity and creed coming together with shovels, black bin bags and hope, to make the ground afresh and the club renewed. Without the fans, there would have been no Wembley play-off final. No chance at glory in the Premier League. Alan Curbishley would have been unlikely to remain in charge if Charlton had not returned to the Valley and we wouldn't have had 13 amazing years with him at the helm. At every stage of Charlton's development the fans have been there to support the club and help it. Which is why with tonight's relegation, we have to come today and fight for the club stronger than ever. Because without every single fan standing up, with one voice, and helping to remove the current regime from their stranglehold on the club, we will never have the one thing the picture above symbolises: hope. We will never again hope for better things, we will never again sit in the stands and cheer on the team with hope and passion in our hearts, and we will never hope to reach the upper echelons of English football again. The word "strangle" is apt: since Chris Powell's League 1 winning side and his controversial dismissal from the club, we have seen the first team starved of its star players, the manager with a passion for the team and winning, and we have seen our youngest and brightest sold at prices well below their worth, when their true value is standing on that football pitch in a bright red shirt. So if you can, come to the Brighton match on Saturday. I am not promising that the team will win. It's about so much more than the result. It's the future of our family club, and the future of our family. I'm game to try and save it if you are. Fans have done it before, and it is time for the new generation to stand up and be counted. I want our Charlton back. It is taken directly on my iPad mini! Which has a pretty decent camera. I'll blog more about this next time. It seems to be a good test blog though! I'm using the Blogger app on the same iPad you see! "Gresley streamlined P2 - further updates"
Some time ago I started work on modifying one of Hornby's Railroad P2 locomotives into a streamlined variant. The identity of this engine has been picked, but it won't be immediately obvious which P2 it is. Today I've been mostly concerned with adding handrails, the lubricators and generally tidying up the cuts made in the body shell to fit the A4 front end. It's nowhere near a patch on Graeme King's excellent P2 conversion (which you can find on the LNER forum) but it serves. For anyone interested, I've used Bachmann V2 valve gear, virtually unmodified, using the same Hornby hexagonal screw to fit the valve gear on as is used on the normal Caprotti valve gear normally found on the base model. As you may have guessed, my model will be wartime black once all of the modifications are done. 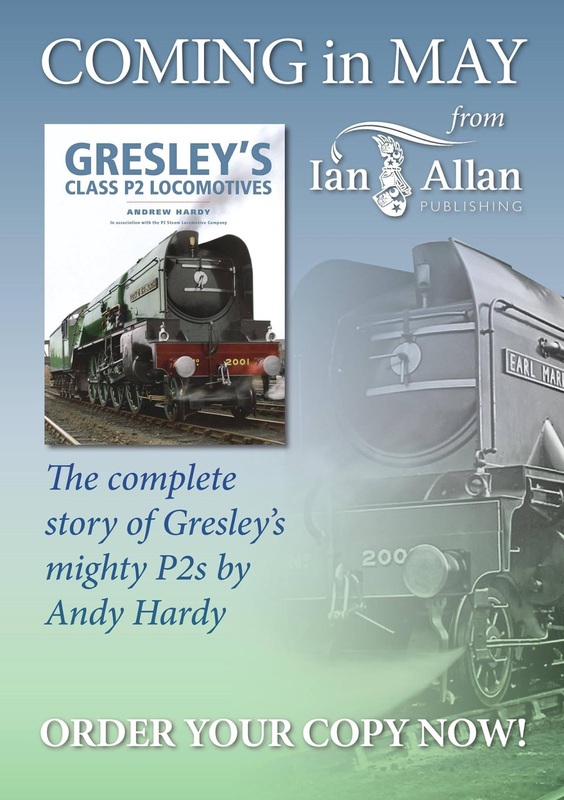 The P2 Steam Locomotive Company is delighted to exclusively announce the publication of an all new book on the P2 class locomotives in conjunction with Ian Allan Publishing. The book, written by the Trust's researcher and archivist Andrew Hardy will feature new and unseen photographs, letters and other material never previously printed making this the must read book on the class. A contribution from the sale of each book will go towards No. 2007 Prince of Wales. This will be higher if bought direct from the Trust. I would like to assure readers of my blog that this book is worth purchasing. It is, in my opinion, the most balanced and fair account of these locomotives ever written: it includes never-seen before archive material, and the fact that its sale directly contributes to the building of no.2007 Prince of Wales is a further bonus. Quite frankly, if you love the locomotives of Sir Nigel Gresley, you need this book in your collection. 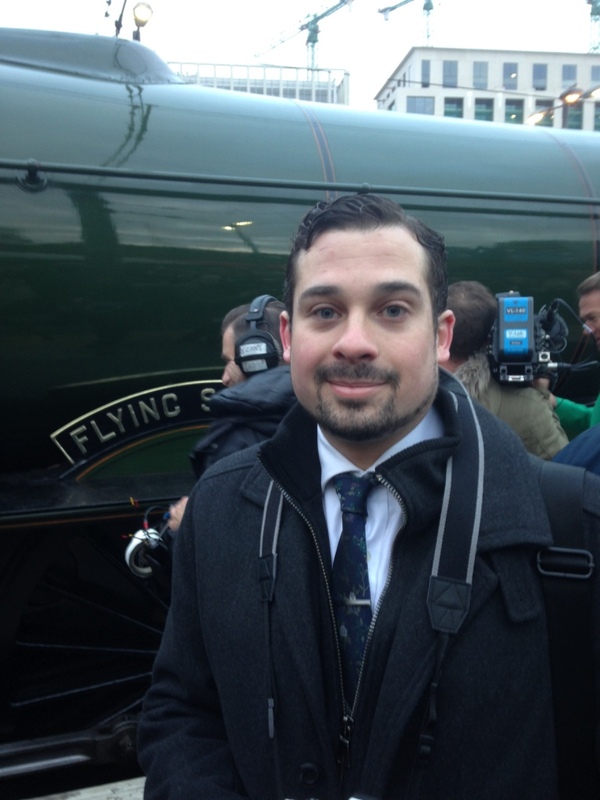 I write this a few hours into the day after the most publicised railway event of all time, to give a hearty congratulations to everyone involved in Flying Scotsman's inaugural run. 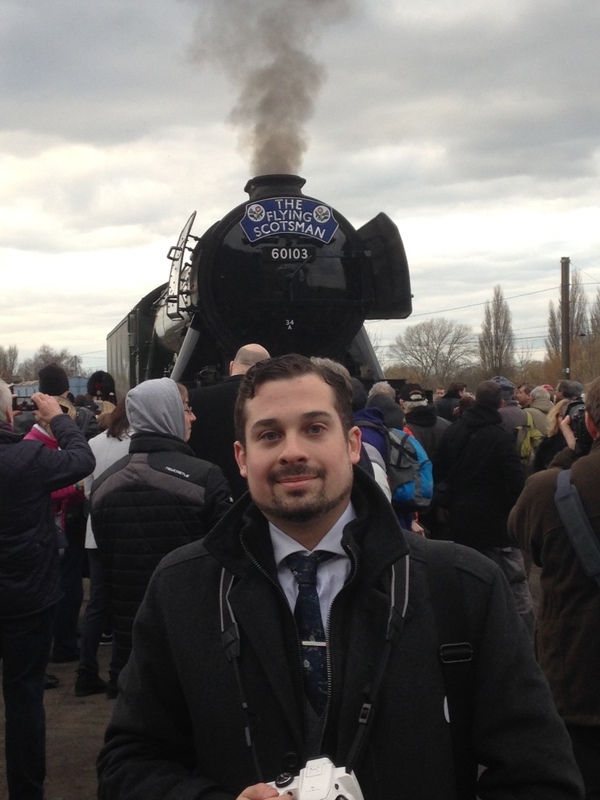 I was on the train, and despite the incident at St Neots, it was a truly brilliant trip. For me, none of the magic was taken away from the day by anything which was perceived to have gone wrong. 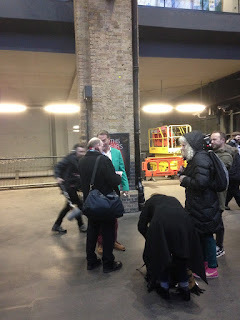 I met Michael Portillo, a true gentleman in every sense of the word, at King's Cross early doors, who is filming for his next in the series on Bradshaw's guide, and he of course had his copy with him. 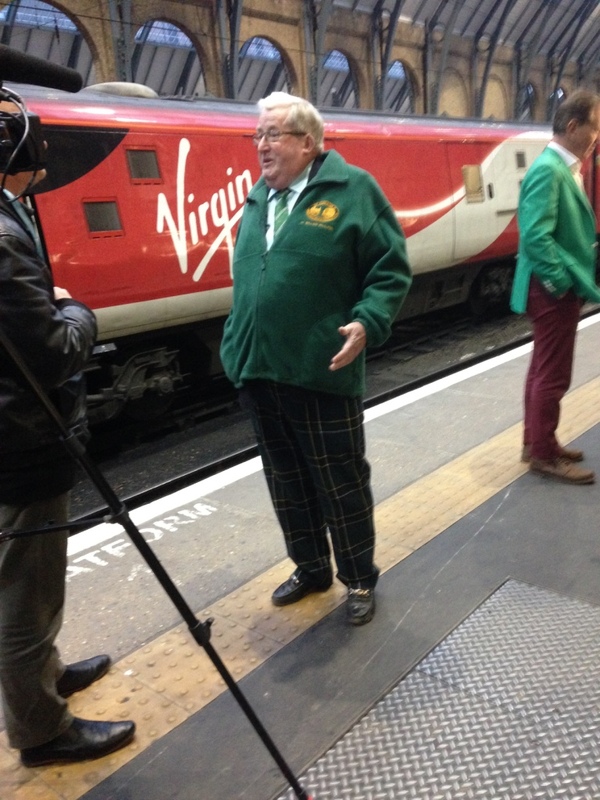 Shortly afterwards on the same platform I met Sir William McAlpine, who shared a heart rending moment with me when he said "I only wish Alan was here to enjoy the day with us". Alan being Alan Pegler of course. I was very choked up by that, and whilst it is true that preservation is the poorer for Alan Pegler's passing, we owe him such a large debt of gratitude for the locomotive still being with us. There was a great tribute to him, in that the locomotive did of course pass the large brick chimney with "Peglers" still written on it on its journey north to York. For me, that was a significant moment passed by us in the carriage with a moment of quiet reflection. We do also of course owe Sir William the same, as a former owner and supporter of the people's engine. I was in coach G and shared my compartment with a delightful group of fellow enthusiasts. The trip was fascinating, as the life experiences of my fellow passengers was something to behold. 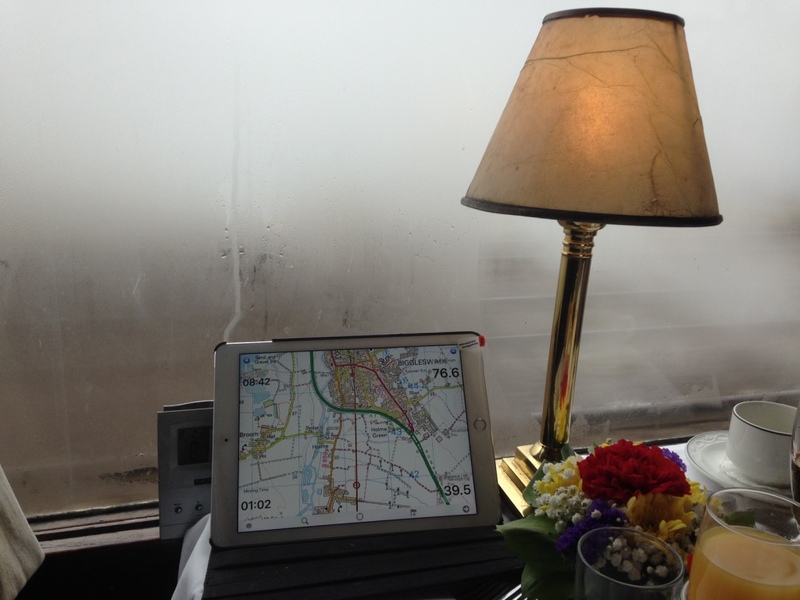 An ex-King's Cross driver, no less, a gentlemen doing timekeeping of the run (and seeing the speeds come up on the iPad as we travelled northwards was great fun!) and a car designer who had worked on the McClaren P1 too, together with a very knowledgeable Electrician and another fellow Scotsman enthusiast. 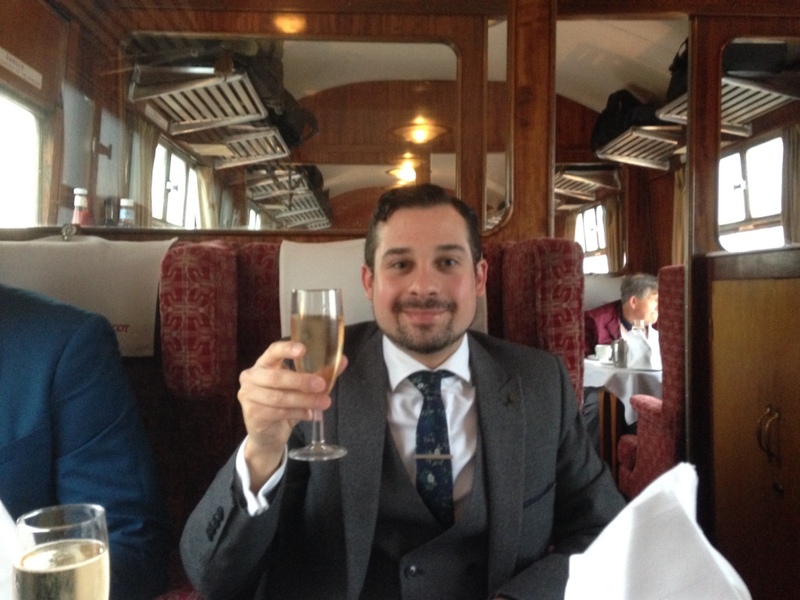 There is nothing quite like the ambience of a steam train at speed on the east coast main line, in great company with food and drink plentiful. The catering staff were fantastic as you'd expect - champagne drunk at half eight in the morning! Such a pleasure cannot be understated! The weather was perfect throughout (perhaps a little overcast on arrival at York) and the locomotive performed beautifully. Speeds in the high 70s were definitely recorded throughout the trip, and she just went on and on, sounding like a sewing machine at times. It was a memorable, wonderful sound. On arrival at York, there was time for a buffet lunch, courtesy of the wonderful people of the National Railway Museum, and time to spend around the museum, taking in the sights and sounds of the exhibits before retiring to the North Yard to see her arrive. The speeches by Mr Kirkman and the head of the heritage lottery fund were thought provoking and enjoyable, and being able to get up close to the people's engine and take photographs and converse with other members of the general public was wonderful. A very human and very memorable experience. 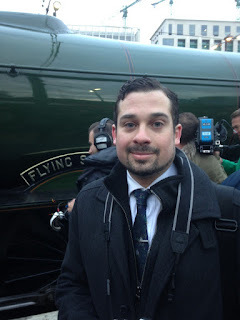 In my interview with Dominic King, I said that the story behind Flying Scotsman was people. It was the story of people who built her, ran her, watered her, fed her, bought her, took her to America and Australia, sold her, fixed her, painted her and loved her. That this still remains true nearly a hundred years after her building cannot be understated. She remains Britain's most treasured locomotive, the engine which shines a light on the pleasures of railway travel and brings people from all walks of life together. Overall, it was just one of the best experiences of my life. Thanks - big thanks - to everyone involved in bringing the legend back to steam. 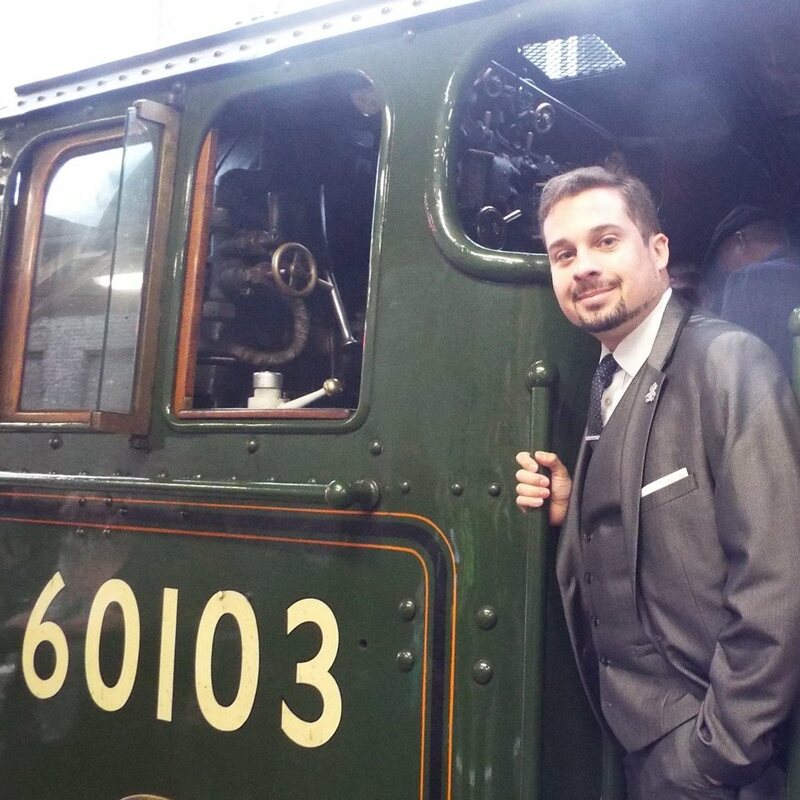 Thanks to the National Railway Museum for buying her, and persevering with the overhaul through everything. Special thanks to Helen May and Catherine Farrell for their part in making the day particularly memorable for me. The buffet lunch and chance to rub shoulders with some icons of the railway preservation industry was terrific. You have all made this young man very happy, remembering times spent with his late grandfather and his father watching this locomotive go by in days past, remembering that very first childhood memory of steam: a dark green steam engine, with 60103 in cream on the cab sides, pulling a train of maroon coaches through the green valleys of Wales.